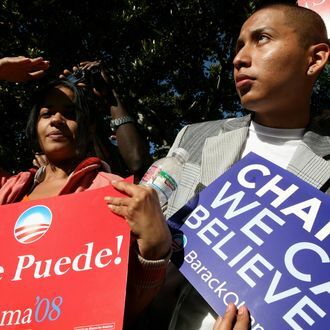 The Obama campaign’s latest effort to win over Hispanic voters sounds extremely familiar — except it makes the case for a second term in Spanish. The pro-Obama super-PAC Priorities USA and the Service Employees International Union have teamed up to release their first Spanish-language ad. The TV commercial, which starts airing on Monday in Colorado, Nevada, and Florida, features some of Mitt Romney’s most familiar gaffes, followed by commentary from Latino voters. CNN provides a translation for those who failed Spanish 101. Next, text on the screen references Romney’s time at Bain Capital. “Mitt Romney made millions of dollars leaving thousands of people without work,” the screen reads. Then the ad airs Romney’s joke about being unemployed. In the commercial, a man responds to the clip, saying unemployment is no laughing matter. “When you are really out of work, you are worried, you don’t want to laugh or make fun of anybody,” he says. Polls have shown that Hispanic voters care more about jobs and education than immigration, so it makes sense that the ads focus on general themes from the campaign. Plus, as the New York Times reports, many Hispanic voters aren’t thrilled about President Obama’s track record on immigration. Proposals that would create new pathways to citizenship have been blocked or stalled in Congress, and despite the announcement that the administration would focus on deporting criminals, few cases involving illegal immigrants with clean records have been suspended.